Offering you a complete choice of products which include pneumatic blind rivet gun and solid rivet gun. We are the top most organization of this industry and offer qualitative range of Pneumatic Blind Rivet Gun. We assure about the quality of our product range as they are well tested in the different phase of production. 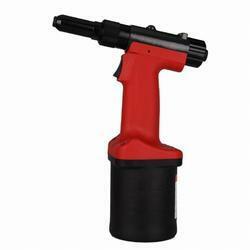 Our range of Pneumatic Blind Rivet Gun is convenient to use, highly designed and widely appreciated by our esteem clients. We own a vast industrial experience of this industry and serving since a long time period. We use advanced technology and recruited the best team for the execution of our whole process. • Powerful, Durable streamlined tool suitable for setting rivets up 3/16" (4.8mm) diameter steel. • Ultra high-speed production tool ideal for an assembly line. • Unique air relief prevents overloading, increases life. • 3/32", 1/8", 5/32", 3/16" Blind rivets without adjustments merely by changing quick-switch, screw-in nozzles. • Rivet Size: 3/32" (2.4 mm) , 3.2 mm (1/8") , 4 mm (5/32") , 4.8 mm (3/16"). Considering our enormous experience and knowledge in this domain, we are well known for offering Solid Rivet Gun. These products are made by using supreme quality raw materials and state-of-art technologies under the monitory of adroit professionals. 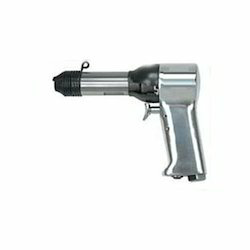 Our Solid Rivet Gun is high in quality and available as per the client’s requirement. Known for their premium designing and an impeccable finishing, the products are very reasonably priced. Rivet Nut Setting Capacity: M6,1/4"